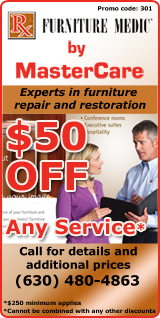 Whether the damage is from water, fire, smoke or vandalism, Furniture Medic by MasterCare Experts in Aurora and Naperville, IL 60540, helps deliver peace of mind to your customers by restoring damaged furniture, millwork and other items to their pre-loss condition. 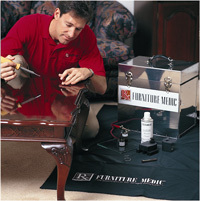 The expert craftsmen at Furniture Medic by MasterCare Experts in Naperville and Aurora, IL will work within your home to provide the appropriate refinishing of your furniture. Since your furniture and antiques can be a substantial investment, they know the refinishing process can protect that investment and return it to its original state. Whether it’s refinishing antiques or enhancing the natural beauty of your wood furnishings, you can call a local Naperville IL 60540 furniture refinishing expert at (630) 480-4863 – Furniture Medic by MasterCare Experts.